Curly in the City: Amsterdam here I come!!!!!!!!! I can not wait for the end of the week...well really for Wednesday to arrive. It seems sooo far away yet, it is so close, and I am feeling a bit under prepared! What is Wednesday you ask.....well Wednesday is AMSTERDAM!!!! I have never been to Amsterdam, and I loooove to travel so this will be a great opportunity and experience. I have my little list of places I want to see, over the few days we are there, so hopefully we will make it! 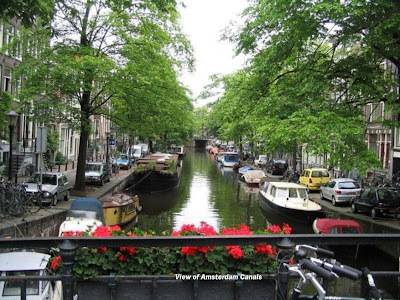 Vintage shopping along 'De 9 Straatjes', the Anne Frank Museum, the Van Gough Museum, Rijkt Museum, shopping in the Museum quarter, maybe stroll through a market or two, a canal ride....I don't know have a blast!?!!! Just strolling and talking with Mom is really going to be the best part, catching up with my best friend! I hope to capture most of this with my new camera, which will be just a blast as well - I have been having soo much fun with learning it these past few weeks. Made friends with the manual on Saturday so even more tricks are up my sleve! Though, through all this excitement I am totally struggling with the 'what to wear' phenom that plauge's most girls. It will be chilly - but roughly the same temp as here, so that is no biggie. BUT....do I wear my newest addiction my new knee-high boots with: tights, dresses cardigans and chunky fun scraves.....or with skinny jeans and cute tops...or bring a mix of both. Do I need to bring sneakers, even though I plan on wearing my boots with everything?! I just got some great new dresses, as well as some new leggings and chunky sweaters, as well some new skinny jeans.....uggh! the teter-totter! I am limitied to a carry-one.....which I don't mind since I have an abnormal fear of my luggage not arriving (which happens to me more than I would like to admit, ie the last entire european vacation - no luggage for 2 weeks no fun!). I plan to start laying out different options tonight, and tomorrow. I will get Mom's opinion on wednesday, then load 'er up and head out! I can't wait!!!!!!!!!!!!!!! !